Yeah Halloween is here today. My kids love it and I have always thought it was fun. I mean think about it for one night you get to dress up in a costume of your choosing and be someone else and people give you free candy. How could this not be a sweet deal. Well tonight was a little different for me. My oldest daughter was invited to a party in which they would go trick or treating. She was so excited to be going with all her friends. This is the first year she had ever gone with out me or my husband and I wonder if it will be her last. I mean when are they too old to go trick or treating. The girl across the street from us is 14 and I don't think she's gone out in the last 3 years. It's sad to see them grow out of this. Anyway I dropped my daughter off at her friends and preceded to twist my ankle in a hole that was covered with leaves. Not fun. Luckily it seems okay just a little sore but none the less a real pain in the you know what. I returned home to find my youngest almost ready to go out and trick or treat. She was a ninja this year and she karate chopped all the way down the street to collect her candy. She loves this costume. Well we went for an hour and she made out like a bandit. The people in my neighborhood gave out the best candy. She was so tired. I offered to let her keep going, but she said she was good. Now we're home I'm starving and all we have to eat is chocolate and skittles. This may seem like a fabulous meal to my 8 year old, but not me. I'm about to get my oldest at her party and then I think some form of take out may be in order. Possibly a bottle of wine as well to enjoy with my husband once we tuck our fairy and ninja into bed. I hope everyone out there had a very safe and happy Halloween. Tonight we were invited to a Halloween party at my youngest daughters friends house. Well my youngest daughter wore her cute ninja costume but my oldest daughter didn't feel like wearing hers. However when she came down stairs I noticed she was wearing blush and eyeshadow. It wasn't dark or anything like that, but it took me a little by surprise. I mean I know she has makeup I've even bought her some for fun, but up to this point she has really only used it for dance recitals, Halloween costumes, and when her friends come over to do makeovers. I didn't make a big deal or anything as I said she was using it in a tasteful way. So this leads me to wonder is she too young to wear it? Should I just let it go for now? Her school doesn't allow makeup to be worn so she would only be wearing it out with her friends. I'm thinking it's okay as long as she only uses a little. In fact at the party tonight several of the mothers complimented her on the way she used it and how pretty she looked. I guess I'm just going to play it by ear and see how things go. As long as she doesn't abuse it. Luckily she hasn't gone goth on me. No black. Oh and she doesn't like mascara. It always freaks her out when I would put it on her for a dance recital. So there won't be those real black eyes staring back at me. Perhaps for her 13th birthday, which is just around the corner, I'll take her to the clinique counter at Macy's and have them do her colors and show her how to apply correctly. Honestly I'm not a huge makeup girl myself. If she's going to use it I want her to use it in a way that makes it look natural. I hate it when I see tween girls walking around with gobs of makeup on their pretty little faces. I always want to wash them off and tell them less is more. Makeup is suppose to highlight your natural beauty. In the end I'm sure my daughter doesn't need to wear makeup, but it makes her feel a little more grown up by wearing it. One more step closer to becoming a teenager. Yikes. Well my 12 year old has been obsessed with vampires ever since she saw Twilight last year. She fell in love with the love story and Edward. She sees vampires in a very romantic light. I always laugh because I remember the scarier movies when I was younger. Interview with a Vampire scared me to death. Yes, they were good looking, but the movie itself freaked me out. She won't be seeing that for several more years. She has asked to see Interview with a Vampire and she was rewarded with a resounding no. I have however allowed her to watch the new show on the CW called The Vampire Diaries and she loves it. She can not wait for it to come on and all her friends are watching it as well. This show is based on a series of books written by L.J. Smith. They were originally 4 books in the series until last year when she released another book called The Vampire Diaries: The Return: Nightfall The original 4 books have been condensed into 2 books. The first titled The Vampire Diaries: The Awakening and The Struggle and the other The Vampire Diaries: The Fury and Dark Reunion The interesting thing to note about these books is that they were originally published in 1991 several years before Twilight was published. I wanted to make note of that because there are some people who believe the story copies Twilight. Not the case. It's just another story about a human girl falling for a vampire. I personally feel they are very different stories. My daughter feels the more vampire stories the better. The story focuses on a teenage human girl named Elena who has lost her parents and is in a very sad place and trying to get her life back to normal. Next enter a brooding vampire named Stefan who is as good a vampire as you can be. He only drinks blood from animals similar to Edward in Twilight. 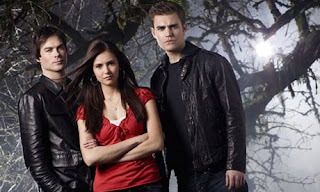 They have an immediate connection because of Elena's resemblance to a woman named Katherine from Stefan's past. Next enter the evil brother Damon. He's just a fun loving bad vampire. This begins a fabulous love triangle. My daughter is completely hooked. She loves Romeo and Juliet type stories and this one totally fits the bill. Her and her friends actually like the evil vampire Damon more than Stefan. He is a very entertaining character. You never know what he's going to do. They find the show very "intense" at least that is the new word they are using to describe it. I'm enjoying the show as well. Hey, whats wrong with cute brooding vampires? Nothing as far as I can tell. I do want to note that this show would not be for every tween. My daughter is 12 going on 13 so she is on the older side of tweendome (not sure this is a word, but I'm going with it). I watch this show with her and if I feel it is getting inappropriate I will fast forward as we watch it on the DVR. As of this time it has not gone to far. Damon is an evil vampire though and you do get him biting humans so if your tween wants to watch this they need to know there is some blood. This doesn't seem to bother my daughter and her friends. They are more interested in the love story. My thought if your daughter or yourself is into vampires give it a try. You may want to check it out yourself first just to be sure. Every tween is different but vampires are definitely the in thing right now. Okay this is the question that makes me crazy. Everyday I pick my kids up from school and as soon as they're in the car they ask. What's for Dinner? Because I'm starving. Well I tell you what I make them a nice lunch everyday. Why are they starving? Apparently dinner is the most important part of their day. Personally by the time dinner rolls around I'm done. I usually don't want to cook. My lovely children however are looking for gourmet meals. This is especially true of my oldest daughter. She usually wants chicken and broccoli fettuccine or calzones or broccoli cheese soup. Now I like all of these meals my self. They are just a lot of work. Personally my favorite night is take out night or sandwich night. I see no problem with sandwich night. It's easy. I like easy. Is there something wrong with easy? Of course the worst is when I'm making something that one child loves and the other doesn't. Sometimes I even have to make two meals. Like tonight. My oldest wanted broccoli cheese soup. She just got her braces tightened so her mouth is sore. I get it I understand so she is getting soup. This is a problem though because my younger daughter won't touch this with a ten foot spoon. So she is getting Perdue nuggets, fries and carrots. It's just aggravating because I don't like making multiple meals yet I do it. I'm such a push over. Well at least I know what's for dinner tonight. Now I have to deal with what's for dinner tomorrow. That's right my daughter is 12 and has decided she's going to be an orthodontist. What has brought her to this decision you may ask. Well I find the whole thing very entertaining so let me enlighten you. She has braces and has had them for almost a full year at this point. We just came back from getting them tightened and she informs me that she is going to be an orthodontist. This has been going on for the past few months so I've been going along with it. Hey why not she can be anything she wants and they usually make good money. So why has she chosen this path? Her reasoning behind this is that her orthodontist only works from 10 to 5. Nice hours. I know that I'd like to have them. He also makes about $5000.00 per child sometimes more and his office is always packed. It's like a revolving door one child goes out and another child goes in. Oh and to put an exclamation point on it he must be the happiest guy I have ever seen. She notices this. The man talks constantly. He gives all the kids nicknames and jokes around with them and why shouldn't he. Life is good. So what does all this mean. It means that my daughter wants a job where she'll be happy, have decent hours and make lots of money. Oh and we shouldn't forget that having lots of money will mean she will be able to buy her dream car. A red convertible mustang. All I have to say is go for it. If that's really what you want. She has the grades for it so far and the drive as well. So in like 12 years or so (I have no idea how long it takes) she could be an orthodontist. So you go girl. Every month I dread the book report assignment. My daughter has to do one every month and every month I have to nag her to finish the book never mind get her to do the report. This month she had to pick a non-fiction book. This made it that much worse. It's hard enough finding a fiction book that she'll read now I had to find a non-fiction book. It was all so typical. Oh, it couldn't be the Diary of Anne Frank as they are reading it later in the year. Again fabulous. I know she would like that one. It was always one of my favorites. Also books about dogs are out as well so no Marley & Me Not that you can get through that one without crying. Last year it took her forever to find a book and she barely got through it. It seemed to drag and drag for her. This year I took matters into my own hands and found her a book I thought she may find slightly interesting. It was Laura Ingalls Wilder: A Biography by William Anderson. I thought she might like it as she would sometimes watch Little House on the Prairie. That show was one of my favorites. Who didn't enjoy watching the everyday life of the Ingall's family? I personally loved watching Laura fall in love with Almonzo. Anyway, I was hoping she would have some interest and be able to get though it quickly. Well I have to say I was pleasantly surprised not only did she get through it quickly she gave me regular updates on what was going on in the book. The way I see it is if she is talking about the book while reading it she must me enjoying it. She loved it. She found Laura's life to be very interesting and she whipped through her book report quickly. So score one for mom. In conclusion all I have to say is thank you Laura Ingalls Wilder for having such an interesting life and thank you William Anderson for writing this book. It made this months book report a breeze. Now we'll have to wait and see what the topic is for next month. I'm keeping my fingers crossed. My niece who is 8 years old has come down with the H1N1. She seems to have a mild case as she only has the high fever. The problem is that she has a new baby sister that is only 6 days old. My family is a wreck. The baby is too little and has no protection from this virus. My brother has separated the girls and the house has been aired out and cleaned from top to bottom. All they can do now is to get the 8 year old better and she is doing her best by resting and drinking constantly. She has the Tamifu. We are all just praying that the baby does not get this. Anytime a young baby gets any kind of virus there's a danger. She is the sweetest little thing. So please say a prayer for my family that they get through this. Thank you. Well my older daughter had a function for school today so my 8 year old wanted to have some fun. She thought the mall was the kind of fun she was looking for. This is so typical. She also wanted her best friend to come. We got to the mall only to find it as busy as Christmas. I know it was raining, but honestly I didn't expect it to be this busy. Not that it mattered we were there and we were going in. They knew exactly where they wanted to go. We went into the Hello Kitty store. It has a name, but we just call it the Hello Kitty store. They looked at everything. The store is all cute. It attracts little girls like crazy. Next we did a run through of Abercrombie. They love that store even at the age of 8. No purchases were made today though. Just a lot of I want that. We next hit Justice for Girls which is my 8 year old daughters favorite store, but I honestly think they like all the little extras they sell in there more than the clothes. They love the lip gloss jewelery, and little toys. We left there with fashion sketch books. As I've said before my daughter is all about fashion design and her best friend shares this interest. I needed to get a gift card so we did that then they spotted Dunkin Donuts and promptly asked for a donut. I said sure it was their mall trip. They ate the sugary goodness and we headed to Claire's another store that attracts little girls like a magnet. Honestly, I would have loved this store if I was younger. Now I find it overwhelming, but they love it. We moved onward to the Apple store where they tried out the itouch. My younger one wants one so bad. As I've said before her sister has one and loves it so she is saving her pennies. They played the Cooking Mama App and were having a blast. I had to drag them out. Our final stop was the candy store where my daughter ordered up a yummy blue vanilla slush and her friend got a very large sugar stick. They laughed and smiled the whole day. I was exhausted, but listening to them talk about their day and eating their treats made the whole day worth it. Just came back from dropping my 12 year old daughter and her best friends off at their school Halloween dance. They were so cute getting ready. They went as fairies so they spent some time putting on very colorful eyeshadow and putting on some jewelry with lots of sparkle. They had to look just right. I smiled as I listened to them talk or should I say giggle about the thought of who would ask them to dance. Butterflies also began to spin in my stomach. My daughter went to 2 dances last year and she didn't get asked to dance and she was crushed. I told her she shouldn't worry about that and just have fun with her friends. Then I tried to explain to her that boys at this age are dumb when it comes to girls. Sometimes they just don't get it and they are as nervous as the girls. This cheered her a little at the time, but I'm so worried it will happen again. My daughter is very shy especially around boys so mommy has butterflies. It's like I was back in middle school. I was shy as well. I remember sitting and watching many of my friends get asked to dance and I just stood there. It was so difficult to endure and I really don't want my daughter to endure that. Well fingers crossed one of those awkward boys will ask her to dance. Of course there's also the worry about when a boy does start to like her. Then do I have to deal with phone calls or should I say texts? I guess it's a catch 22. Oh well I just don't want my baby girls heart broken. Hearts are such fragile things. It really is hard to be a tween and I know I would never want to live through it again. Though I feel like I am. This has got to be my favorite that I'm following right now. I know I've said it before but I fall deeper in love with it after every episode, and this weeks episode, Mash-up , didn't miss a beat! The music is just so good. I really get this feel good feeling. My daughter and her friends are totally obsessed. One of my daughters best friends came running up to me and wanted to know if I watched it. She loves it and so does her dad. They don't miss it. My daughter has to watch every Wednesday because on Thursday that is all everyone is talking about. Last nights episode had great music. I particularly loved the song Sweet Caroline sung by the character Puck. I had never really paid that much attention to him before but he really did make me take notice last night. He has an amazing voice and I truly hope they showcase it again. I have got to download this song. Being from Boston this song has a special place in my heart. They always play it in the middle of the seventh inning at Fenway and the whole place explodes into song. I also loved the Bust a Move Song that the teacher performed. It really brings back memories. Oh and the slushie war was just too funny. This show needs to stay on for a long time. I know that when I flick it on I will be smiling, singing and laughing through the whole show. Long live Glee. I have some very exciting news. The makers of Harumika are giving me the chance to give away one of their starter sets. Harumika is my daughters favorite fashion design activity. She plays it for hours and hours. Her friends at school love it as well. I'm so happy that I will be able to share this great activity with someone. I know that your child will love it as well. The best part is there is no needle and thread. They just tuck the fabric into the back of the dress form. It's very easy to use and the creativity is endless. If your interested in winning this great Starter Set please leave me a comment and include your email address so I can get back to you. I will give 2 extra entries if you become a follower. I am sorry to say that this giveaway is only for US Residents. The company is unable to ship outside the US at this time. This is a great item to put away for Christmas or for a rainy day. This is my first giveaway so I'm very excited. I will be taking entries until November 8. I will announce the winner on November 9th. Good luck! I have already told you that my daughter is addicted to her itouch. I thought that I would share with you her favorite Apps that keep her attached to it. So here is the list. 1 to 10 with 1 being her favorite game. She has a great time playing all of these games. 1. Sally's Spa - Sally's back and ready for a relaxing rush in luxury spa locations around the world. Refresh your customers with saunas, manicures, bath bombs, massages, hot stones and more. Enhance the experience of your clients with upgrades for your rapidly growing business. 2. Ranch Rush - The Plot: Sara learns that her boss, Jim, might have to sell his Nursery to developers for extra cash, putting an end to her favorite job. Can Sara earn enough money in 8 weeks to send the developers packing? Help Sara turn 3 acres into a thriving Farmer’s Market Ranch. Harvest fresh produce, gather eggs from ostriches, collect honey from bees, whip up ketchup from tomatoes and much more! 3. Diner Dash - Diner Dash is an action strategy game in which the player takes the role of Flo, a stockbroker who quits her job to run her own diner. Gameplay involves seating customers and guiding Flo around the restaurant to serve customers. If enough money is earned after each level, play progresses to the next. As the game progresses Flo updates the dilapidated restaurant she begins with and builds three further restaurants, which provide new settings. 4. The Sims 3 - The #1 PC game franchise of all time comes to today's hottest gaming platform! The Sims 3 brings exciting new gameplay and endless possibilities all on your iPhone/Ipod Touch! Enjoy unexpected moments of surprise and mischief, as you choose whether (or not!) to fulfill your Sims' destinies and make their wishes come true. Create and customize your Sims appearance and personality, then take your Sims out of the house and into the neighborhood with all new open world gameplay. Make their world your own! 5. Jojo's 2 - Jojo's Fashion Show 2 is a clothing match-up game where your goal is to help Jojo and her daughter, Rosalind in creation of stylish outfits for male and female models and compete in a number of fashion shows at Las Cruces. In Runway mode, you have to choose the outfits like tops, bottoms, accessories and footwear for your models which will compete with others. Gain the points based on how closely they matches with criteria of particular style. Your fashion sense must match with target to move on to the next level. Many of these games have a free trial so you can see if you want to play more. I think this is a great feature because it really lets you know if you want to spend the money to keep playing. So if your looking for some fun apps to try out on your itouch you may want to give these a try. You can find out more about the games by clicking on the itunes buttons if you have itune applications on your computer. Have fun. Yes, I know I write a lot about New Moon and Twilight stuff, but I'll tell you it's one of my oldest daughters favorite things. She loves Edward. I was at Target yesterday (I'm always at Target) walking by the place they keep the trading cards and a box caught my eye. It was a box filled with New Moon Trading cards. I was so excited. My daughter loves Trading cards for everything. I'm responsible for this I'm afraid. I love trading cards and they make them for everything. When I was little I caught the Chicken Pox and I was miserable. It was at the beginning of summer vacation so I couldn't do anything. My mom wanted to cheer me up so she went to the store and got me some strawberry soda and a package of Return of the Jedi trading cards. I loved them. Star Wars is one of my favorite things period. I wanted to be Princess Leia and hang out with Han Solo and have a cool brother who was a Jedi. So from that point on I have loved to collect different trading cards. I still have the Return of the Jedi cards from way back. Now my daughter likes to collect them so when I saw them I quickly grabbed a couple packs. They were only $2.99 which is cheep for trading cards. When I got home I handed them over and she was so excited. Unfortunately there wasn't one with Edward on it. There were plenty of Bella and a couple of Alice so she was happy. She really likes Alice, but who doesn't. The girl steals a yellow porsche in the movie. I guess I'll just have to go back and grab a few more packages. These make awesome stocking stuffers. She uses them as book marks when she gets doubles. I'll have to act quickly though because last year when I went to get her Twilight cards I couldn't find them anywhere. I asked the guy at my local comic shop (yes I go to my local comic shop) he told me they couldn't keep them on the shelves. I asked him if they were bought by screaming tweens and he informed me this was not the case. They were being bought by 40 year old guys who were making a killing selling them on ebay. This makes me nuts. I really don't like it when people feel the need to take advantage of kids. Bottom line I will be picking up several packages and putting them away for Christmas. It's going to be a Twilight Christmas for my 12 year old. My oldest daughter has never been a big reader so I have always tried to find books that would catch her attention. It's easier said than done. If a book is to long she looses interest right a way. A book really needs to grab her attention and keep it. Many books I've suggested she read take a little while to get interesting so it's a real struggle to keep reading it. Book report books are the worst, but they must get done. 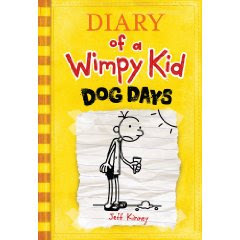 One day when she was in 5th grade we were in the book store and she picked up Diary of a Wimpy Kid by Jeff Kinney. I'd never heard of it, but she told me that this was really popular right now and everyone said it was really funny. I asked her if she wanted to read it and she said she would. She seemed so enthusiastic I thought. Why not. If she'll read it I'm all for it. It's rare for her to really want to read anything. We got home that day and she headed up stairs to read. I was in shock. She is never that interested in reading anything. She was finished the next day. I asked her if she liked it. She said she loved it. It was very funny and she couldn't wait for the next one to come out. I was thrilled. Anything that gets kids to read especially my kid I'm all for. These books have a different kind of set up to them that I feel doesn't intimidate kids. They look fun. The words look hand written and there are different cartoons throughout the book. No, this isn't a classical novel, but it is a novel that children will enjoy reading and in some cases relate to what the child is going through in the book. Again I'm sure it's not for every child, but it is for mine. There have been as of this past week 4 books released in the series. I have purchased the last one for my daughter for Christmas. I know she will love it. My youngest one is almost old enough to read them as well. I feel the age level associated with these books is appropriate at 9-12 years. So if your looking for a great book to get a child in this age that will be a quick and easy read give these a try. You won't be sorry. Okay for those Twilight fans out there. I was just at Target and they already released the New Moon Soundtrack . I couldn't believe it. This is so going to be on my daughters Christmas list. Really anything that has to do with Twilight and Edward is on her list. The soundtrack was on sale at Target, but I did not pick it up and I'm glad because it's even cheaper at Amazon. I have previewed the songs and I really like most of them. They really seem to fit with a vampire movie. Who is this soundtrack for anyway? My daughter or me? Maybe both, but it will be a wait till Christmas. It's so hard to wait though. I think being a tween has got to be one of the hardest times in life. Everything is changing. Your body is doing all sorts of crazy things. One thing that has affected my daughter at this lovely age is dandruff. It is very frustrating to her and it has taken awhile for us to put it under control. First I had to deal with informing her that she had dandruff. She either didn't know or didn't want to know. Still not sure on that one. Anyway when I told her there was a complete and total break down. She started yelling "Why is this happening to me?" "It's not fair" oh and my personal favorite. "I hate my life." followed by the stamping of her feet and running upstairs crying and slamming her door. It's so hard because she doesn't want to be picked on at school. Girls can be very cruel so I knew exactly what she was worried about. I wish it wasn't this way, but it is so the only thing we could do was attack the dandruff. Anyway when she calmed down I told her all she had to do was use an anti dandruff shampoo. Well I thought this would be the simple solution. You know buy the shampoo tell her to use it and in a few days it would be gone. We were not so lucky. I started out buying Head and Shoulders and told her she needed to let it sit for 2 minutes on her scalp. Well I left her to it and in a few days it wasn't better. I asked her if she was rubbing it into her scalp and letting it sit. The reply I got was "What do you mean?" Right so I wasn't getting through. I knew at this point I had to show her what I meant. I did and we seemed to be on the right track. She got the hang of it. This was wonderful for about two weeks and then it seemed to stop working. Okay well I thought maybe we needed a stronger shampoo. We moved on to Neutrogena T/Gel I remember using this when I had the same issue. The only problem is she didn't like the smell of it. I told her to try it. She only needed to use it twice a week so she got used to it. This shampoo seemed to work much longer and then the dandruff started to come back again. This really frustrated her and me because I take the brunt of it. It seemed to be happening to many of her friends as well. I talked to some of the mothers it seemed we were all doing the same thing. I was at a loss. I called my pediatrician and she didn't really have anything else to tell me. All the over the counter shampoos are pretty much the same. One of my friends who has a daughter the same age was also struggling with this. 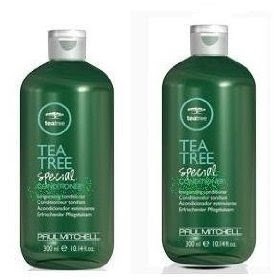 She suggested Paul Mitchell Tea Tree Shampoo I bought it for my daughter. It smells like peppermint and it tingled on her scalp. She loved it and it worked wonderfully. We seemed to have found our answer. However, after a few months it seemed to not be working as well. I discovered that if we interchanged it once in a while with the Nuetrogena T/Gel the evil dandruff stays away for the most part. Thank goodness. It seems like every part of early adolescence is a struggle so if I can make it a little better I will. These products work great for my daughter. I can't guarantee that they'll work great for everyone, but if your a mom struggling with what to do for your tween or teen who has dandruff I would definitely give it a try. Okay it is just way too cold out this morning. Yes, I live in New England and it has been getting progressively colder over the last week or so, but I feel like today it just bam hit me in the face. The heat is cranked and my eyes are all dried out from it. That means my contacts need a break so I'm wearing my glasses that I hate. Stinking cold weather. This also means the fight in the morning for the winter weather wear gear that the girls need to wear. Luckily my older one has decided she likes her jacket so there were no issues with that this morning. She went off no problem. Now it was the little one who is 8 and just heading into her tween years who gave me a little trouble. It wasn't really trouble per say, but it was a nuisance. She loved that I gave her a winter coat to put on. She loves it. It's her favorite color, green. However, she wanted gloves. Now as I've already said I'm not really ready for this cold weather. You would think I could put my finger on them quickly. No sorry not going to happen. I could not find a matching pair of gloves to save my life or sanity this morning. I know we have them somewhere, but they were put away when spring finally decided to arrive last year. I'm sure it's a very safe place. She was disappointed, but said maybe I could find them for tomorrow. Right. She is a very reasonable and sweet child, but she's not going to forget about the gloves so I'm either going to have to find the ones I put away or grab a new pair from Target. This means spending a good chunk of my day trying to find the Rubbermaid tub I put them in. I wasn't ready to drag out the winter stuff. Sigh, I guess I have no choice. Rotten New England weather. Let's hope we get to enjoy the foliage before the snow falls. Oh wait did I mention there's snow in the forecast for Friday. Now where are those gloves? Okay well this morning started off a little shaky. My oldest daughter was tired and cranky and didn't want to wear the jacket I handed her. She said the arms were too baggy. This is the same jacket she tried on about a month ago and really loved. Anyway she grabbed her sweatshirt instead and said that would be fine. She hopped in the car leaving me to wonder why I bought the jacket and if it would ever get worn. I picked her up after school along with her sister who can't stop talking. I got the full run down of what happened in third grade today. Then there's the older one who said nothing. More often than not I find this is how she comes out of school. I ask her how her day was and she replied it was fine and then stared out the window. I asked another question and pretty much got no response so I stopped asking. We dropped her sister at her activity and got back in the car to head home. I asked her again about her day and finally I couldn't get her to stop talking. Which I love. I want to hear all about her day and how things are going. Bottom line is she needs a good 15 to 30 minutes of quiet to recover from school. She loves to tell me about the stuff from school, but only when she's ready. I have come to accept it, but I always wonder if something is wrong. I need to have patience .Patience is something that a mom with tweens must have for so many different reasons. This is just one of them. Oh by the way she said she was sorry about the jacket and she really did like it and thankfully will wear. I tell you it isn't easy. Yesterday was Columbus Day so my girls had the day off and of course they want to do one of their favorite activities. Go to the mall. We did all the usual mall stuff, but there was one thing they could not stop talking about. We went into Sephora, the cosmetic store. They were looking all over at all the stuff that makes tween girls go crazy. You know nail polish and eye shadow in every color you can imagine and probably a few you can't. Then we reached the perfumes. Oh so many to smell, but there was this one display that caught their attention. 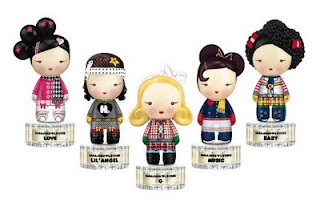 They were perfume bottles that had these cute little dolls on top of the bottles. They were so cute or kawaii because they looked like little Japanese Dolls. Now I personally love Japanese dolls. I collect Jenny Dolls so these little bottles had my attention as well. They were dressed in these cute wintery outfits and the sales girl told us they were a limited edition and she just put them out. They were called Harajuku Lovers Snow Bunnies . I guess they are a perfume line created by Gwen Stefanie. The girls smelled all the different scents and the favorites were the one called G and Love though they really liked all of them. Each bottle was $30. My thought was these would make awesome Christmas gifts. They thought so as well because as we were leaving the store they asked if maybe they could get one as a Christmas present. I'll tell you what it is. It's my 8 year olds favorite new activity. When she first told me she wanted one I had no idea what she was talking about. Finally one day she screamed for me to come to the TV. I came running not knowing what the problem would be. You never know. I've learned early on to come running and ask questions after I've assessed the damage. This time it was only to catch a commercial which was over by the time I reached her. Thankfully we have a DVR so I rewound it. After I scolded her for screaming bloody murder for me to watch a commercial I finally knew what Harumika was. It's this wonderful way for young girls to design fashions with out having to use sewing machines. The set comes with one or two dress forms and pretty material and trims. I didn't really get how it worked, but then my daughter saved her allowance and off we went to Toysrus. She got the wedding set and couldn't wait to rip open the package. Her new thing is she wants to be a fashion designer. She loves watching Project Runway They come up with some cool stuff on that show. I like watching it as well. It's one of my guilty pleasures. We got it home and she took out all the pieces. It took just a couple of minutes to figure it out. You take the fabric that comes with it and you wrap it around the dress form. There is a place on the back of the dress form where you tuck in the fabric using the stick that comes with the set. It hold it in place well. Then you dress it up with the trims. She plays with this for hours and not only that her sister who is 12 got in on the action. She loves it to. They set up a little fashion show for us. Seriously a great toy. I really wasn't sure from the commercial. You really never know if these things are going to work until you get them at home, but I'll tell you no worries here. It works. She took it to school to use at snack and recess and it was a huge hit. All the girls love it and her teacher even comes over to give it a try. This is a great, fun and creative toy for girls and it's very easy to use so if you have an aspiring fashion designer in your home you may want to think about getting it as a Christmas gift. It's so worth the money and you can add your own fabrics and trims so your little fashion designer can come up with new ideas. Update: Win a FREE Harumika Starter Set! Let me begin by saying I love ipods. I personally think they are the greatest invention since chocolate. A few years ago my husband got me one for Christmas. They were pretty new and I wanted one so badly. See what a great guy he is. Anyway I love it. How can you not? I took all my cds and put them on this tiny iPod Nano. All my music with me all the time. I hook it up to my car and again I have my music to listen to while I drive. Nothing better right? Wrong. They came out with the iTouch. This is the coolest thing since chocolate. Now let me say this I don't have one of my own, but my daughter does. She saved all her money for over a year and finally was able to get one. She loves it and takes it everywhere exept school that is. If you get caught with one it becomes the principals. She's not willing to chance it. A few of her friends have them as well. They are just as attached. She has all her music, a few movies (twilight of course), games and of course all those wonderful Apps. It really is a lot of fun. I find myself using it and wanting one of my own. The games I have to say are one of the best parts. After she finishes her homework she breaks it out and has a great time with some game she has downloaded. You can also hook it up to the net if you have wifi available where you are. Not to mention the fact that you don't have to have a headset on to hear it. It has little speakers which is nice because my daughter really doesn't like the earbuds. I'm not a big fan myself. Bottom line this is a great little gadget that my daughter is definitly using to the fullest. I basically have to pry it out of her hand when it's time to go to bed. I need to start saving up for my own. Last year when my daughter entered the 6th grade. She asked me for a cell phone and I said no without blinking. I thought what does she need one for I pick her up from school and the activities she does after school are all very short. I never leave her at a mall or the movies by herself. Not to mention I barely use the one I have. Most of the time I forget it at home or if I do have it, it's dead because I forgot to charge it. The bottom line is I just don't get cell phones. Well Christmas came last year and again she asked for one and my husband and I said no. I know we're mean, but as I said I just didn't get the point. She went back to school after the Christmas break and she was so grumpy and I asked what was wrong. She said everyone got a cell phone for Christmas and that's all they're talking about. Well that's a typical tween answer for anything they want. You know "everyone has one, but me." I wasn't believing it and so we went on. Then one day when I was waiting for her to come out I started to see one after another flipping out the phones as they walked out of school. I was shocked. I couldn't believe they really did all have cell phones. Then she went to a friends birthday party and all they did was play with their phones and talk about them. Well I hated that she felt like such an outsider for not having one. Yes, I know it's peer pressure and I shouldn't feed into it, but I felt badly. I started to ask the other parents and yes they had gotten them cell phones for Christmas. I guess it was the new cool toy. Lucky for my daughter I'm not unreasonable and her birthday was coming up so. My husband and I revisited the idea and we thought she could get one so we caved. We got her a cell phone. We're not the first parents to cave and I'm sure we won't be the last. Not only did we get her a phone we got her a cool cell phone which is probably outdated by now, but it's better than mine. 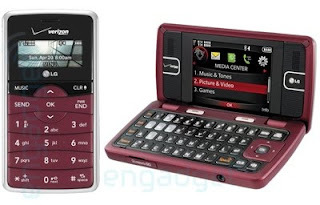 We have Verizon so we got her the ENV2 which is a texting phone. I figured if she's going to have one she might as well get a good one that has a GPS locator and all the other cool stuff. She was so surprised and so happy to receive one. We made her year and her life apparently. Did we do the right thing by caving? I don't know, but my daughters a good kid she works hard in school and helps around the house so if we have the ability to give her something she really wants I don't see anything wrong with it. Now onto texting. I think it's important for any parents to know if they're getting their child a phone they should know that they are going to want to text with it. You should always get the unlimited texting. If you don't get the unlimited texting you're going to end up with the biggest phone bill of your life. Luckily when we got her phone we immediately signed her up for unlimited texting so it wouldn't be an issue. Some of her friends parents weren't so lucky. One of her friends told me she got in big trouble because the bill came and she had run it up to $350 from texting. Now that's not even that bad. I've heard of other bills that go well over $1,000. Bottom line you either pay an extra $5.00 a month or a ridiculous amount. Tweens love to text. I've seen some of my daughters messages because I keep an eye on what she's up to. Most of them are 3 words or less. So please if you are thinking about getting your tween a cell phone get unlimited texting. Save yourself the aggravation. I've been thinking about getting my girls charm bracelets for Christmas. I thought it would be a special gift and one that could be added to by others. I spoke to my mother about it and she reminded me that she had one. That brought back such wonderful memories. When I was a little girl I remember sitting on my mothers bed and she let me look through her jewelery box. I loved her charm bracelet. I always thought it was magical. I used to play with all the charms. She had a little typewriter and a nurse charm and I would pretend the nurse was typing on the typewriter and then I'd have her hop in the convertible charm she had. My favorite charm was the mailbox it really opened and I thought it was so cool. I would write little letters and put them inside the mailbox. She reminded me that my dad gave her the bracelet and the charms. That made the memories even more special. My dad died when I was 10 of cancer. He was awesome. I still miss him very much. He died so young and it still seems so unfair. My mom was lucky enough to find another awesome guy though. I'm lucky that when I was growing up I had my dad and then my step dad who is just so great to my mom and is always great to me and my girls. They love him to pieces. When grandpa comes in the room their faces always light up. My girls know all about my dad though. I think it's important for them to know they had another grandfather. Seriously how lucky are they to have one watching them from heaven and one here on Earth. Yesterday my mom surprised me by giving me the charm bracelet. I was so happy. I wore it all day and told my girls all about it and the different charms. They loved it and the favorite one was the mailbox just like me. So thanks mom. I love you. My oldest daughter is getting ready for the Halloween dance at school. This means it's time to come up with a costume. My 8 year old is so easy she picked up the Costume Express catalogue and said I want to be a ninja. I Looked at it, it was cute so sold. I ordered that baby and she is very happy. Now for my 12 year old well it's a long drawn out process. Last year she was a gypsy and won a prize for most original costume. Well this year she wants to win again. However, she wanted to do a group costume with her friends. Not so easy. Just too many cooks if you know what I mean. The main problem of course is that I don't want her to wear some skimpy costume that isn't appropriate. There will be none of that in my house not to mention she'd be sent home from the dance. So they had to come up with something fun and cute and age appropriate. First thing they thought of was a group of superheroes. This was a cute idea and I was fine with it. That didn't last long though. Next they wanted to be Deal or No Deal girls and I'm thinking cute yet you can't wear dresses like that to school and I'm not buying you a prom dress at the age of 12. Then a few wanted to be faeries, but some of the others not so sold on the idea. I just wanted them to hurry up and decide because then I have to put the costume together. Finally, my daughter and one of her friends stuck firm with the fairy idea and 2 others decided to go as cute nerds. Okay we now have a costume idea, but how am I going to get it together? The first thing I do is call mom. My mom that is. She's great at this kind of stuff and well I'm okay, but with her help I know we can get it together. So today I spent most of it trying to find a long sleeve or short sleeve leotard for the girls to wear on top. We were not successful at the stores we went to so I'm going to look on line. However, we went to the fabric store and found the most beautiful fabric to make a fairy skirt. It's pink, light blue and lavender and has glittery butterflies on it. We snagged that right up. We plan to make a sort of beach cover up skirt with it. Also we hope to get some tulle with glitter on it for a top layer give it that magic feel. They had that as well at the store, but I'm not sure what the tops to these outfits will look like yet so we have to wait. There will also be a flower wreath and maybe a flower necklace or something. Not really sure on that. I don't want her to look to much like a little girl even though to me she will always be one. If anyone out there has any ideas I would appreciate it. My older daughter has a very difficult science teacher this year and when a test is coming up she literally has to know the chapter. We're talking the little blurbs under the pictures and all the charts on the side. This is the first time she's had to worry about every detail and it's difficult. Anyway, she studied for a while and then she asked me to quiz her. This is a normal occurrence and I'm happy to do it. I see it as part of my job as a mom. Well I start quizzing and she starts getting confused. She gets angry and says "but I know it." I try to stay patient and tell her that she needs flash cards. It's getting late so I make them and tell her she needs to study them and I'll quiz her in a little while. I have to dry the little one's hair. Well that sets her off she thought she was done studying and that it was now TV time. My older daughter loves TV. She looks forward to getting her homework done everyday so she can just chill out in front of the TV. She has so much homework she's lucky to get an hour of TV a day. However, last night I wasn't satisfied with the studying. She jumps off her bed and runs into the bathroom slamming the door leaving me staring after. I'm thinking you've got to be kidding me. Seriously, if she just sat down and looked at them for about 15 minutes she would be fine. Oh no we have to have drama 24/7. Okay she finally calms down and I'm telling her to just do it and that I'm only trying to help. I mean really do you think I wanted to write out 20 flashcards? I had a disaster in the kitchen waiting for me. Anyway she studied the flashcards and guess what? She knew the material so much better. I know it's shocking mom was right. she'll do great on her test now. It was just a matter of getting her to study. Don't get me wrong. I mean I get it no one wants to spend all day studying, but if you want good grades you have to put some effort in. She went off today feeling confident and having the flash cards mom made to review before her test. I'm telling you middle school is going to be the death of me. Okay right the day starts off with my alarm going off. It's still seems dark outside. My bed is warm and I'm so comfortable and I'm pretty sure the dream I was having is way better than what's going to happen when I start this day. I get up though because if I don't get moving immediately the whole household will be thrown off. I head down stairs and grab a quick cup of cereal flick on the news to check the weather. Heaven knows what kind of day we'll have in New England. I'm not a coffee drinker so no caffeine pick me up. I know shocking, but I never cared for the taste. The only coffee I like is Dunkin Donuts coffee coolatas and we all know that it may have that fabulous caffeine, but it also has tons of calories so that's a treat I only have once a week. Maybe today the way things are going. Anyway moving on I put the dog out. She's the cutest little thing ever and I need to make sure the coyotes don't get her. Yes, they would think she's a great snack. Anyway it's then time to wake the girls. The little one is the easiest I go in and she pops out of bed right away and heads to the TV to get to it before her sister. It's SpongeBob time. Good thing I already caught the weather. Moving on to the older one. She's a little harder. Completely covered by her comforter I have to pop the shade to get the light in the room and remove the comforter and ask if she heard me. I usually get a grunt and I move on hoping she'll get up because I have to get the breakfast going and make their lunches. Neither one is a fan of hot lunch so they take it everyday. The little one is halfway through eating when her sister arrives and plops herself on the couch. Still not talking. I hand her breakfast she eats in silence. When they're both finished it's upstairs to get dressed. Apparently this is a race because I hear arguing all the way up the stairs and someone touched someone. It's irrelevant. I just want them to get moving so they won't be late. Then there's the bathroom. Someone made a mess with the toothpaste there is water everywhere from when they washed their faces and of course they try to do all of it at the same time so there is more arguing. What's a morning without it? I'll tell you it's not a morning. It's now a race to get back down to me so they can get their hair done first. They both have long hair. This is usually just a pig tail, but we are still in lice alert so we have braids going on. The little one beat the big one. This is a very usual occurrence the older one is much slower. I had to yell up three times this morning to get her moving. All with the same response. "I'm coming." Sure she is and so is Christmas. She made it down as I was finishing the lunches. I did her hair through all the complaints that I was pulling it. The girl has really long hair so snarls happen. I don't mean to pull in fact I don't think I even did it's just the fact that I'm doing it at all. It's time to find shoes. They're never where they should be. Heaven knows why. They find them and the older one informs me that her sneakers are dirty and she is trying to get them clean. Seriously you have to be kidding me. We were out in the rain the other day and they got dirty so now I have to clean these shoes in 2 minutes. I grab whatever cleaner was on the counter. I think it was Windex. I get them done just as daddy is heading down the stairs to drive them. They head to the car, but not without hitting each other accidentally with their backpacks which are totally weapons with the amount of stuff they have in them. This leads to more arguing. I kiss them and then my husband. Close the door and wave as the garage door goes down. I then go inside and collapse on the couch for a moment trying to get motivated to do what needs to be done. Oh yeah I definitely have a case of the Mondays. This show is so much fun. I saw the commercials for it back in the spring and they had my attention. The music was great. My older daughter was also interested. I wasn't sure if it was okay for her, but I thought we could give it a try and if I deemed it inappropriate then I could always pull the plug. I watched it with her and I couldn't stop laughing and the music was just so great. The kids on this show are so talented. My daughter went to itunes and bought the cover they did of Don't Stop Believin. She listens to it all the time and I have to say I do as well. The thing with this show is that it is basically making fun of high school and all the things that go on in high school. My thought is some of the shows they make aiming for the same age like Gossip Girl, and 90210 my daughter is not allowed to watch, but this one I think is okay. First off we watch it together so if anything questionable comes up we talk about it. I'm not going to leave her thinking about these things on her own. Second it's really the music that she loves. We DVR the show and she always goes back and rewatches the musical numbers. Third this show basically laughs at everything and everybody. No one is safe. I love that because if you can laugh at yourself then maybe just maybe things will be a little bit more fun in life. If you think about everything in a tweens life it is so full of drama so if this makes her laugh and see that things can be funny I'm all for it. Bottom line this is a must watch program in my house. I don't feel however my younger daughter is ready for it. Though I do let her see the musical numbers and she loves that. As a mom you must always make the final decision on any type of program your children are watching. Just because I think it's okay doesn't mean another mother will feel that way. My advice check out the show before you let your child watch it or watch with them and make it a conversational piece. Oh I've also just discovered that the Glee soundtrack is available for pre-order at Amazon. It comes out on November 3rd. This is a must have for Christmas. Not sure if it's a must have for my girls or for me but it's a must have. Anyway you look at it if I buy the cd all three of us can load it onto our ipods so everyone is happy. This won't be the last time you hear me talk about this show. I just love it. Seriously I can not believe that they now have party plates and napkins with pictures of everyone's favorite vampire and werewolf. My daughter was so excited. Really how fun for girls to maybe have a little party or get together before or after they go see New Moon on November 20, 2009. You know grab a little pizza have some Shirly Temples and off you take them to go see their favorite movie. I think I may have to pick some of these up. I'm only afraid she may want to hang them on her wall as opposed to eating off them. The Twilight frenzy can only continue. The other night my daughter's school had a high school fair. Granted she's only in the 7th grade and she still has another year to figure out where she's going to high school. However, everyone kept telling us how important it is to start looking now. Okay right so here we go. First off my daughter usually wears a uniform to school but for the fair she could wear whatever she wanted and I told her to look nice. She comes down the stairs sporting a cute skirt and and sweater her grandmother got her from Abercrombie & Finch. It's her favorite store. Actually I think it's everyone in her classes favorite store. Personally I think they're a little pricey and always head to the back of the store where the clearance racks are. Anyway she looked beautiful and all grown up. Realization was seriously settling in on the fact that she will soon be heading off the high school. I took a deep breath and we headed out to the fair. We entered the school's gym and there were about 15 schools set up. It was so overwhelming. She saw her friends and immediately went to them and her father and I had to follow behind. She had no idea which school she wanted to check out first so we kind of randomly picked. A few we skipped because they were all boys so clearly there was no need to check them out. The first school we looked at she had heard about and it's not too far away. When we got to the booth my daughter just stood there having no idea what to ask the girls that were there anything about the school so I stepped in and started asking questions. The girl was very sweet and you could tell she enjoyed going to this school. It offered many things that my daughter wanted and they were giving out free pens and a cute little mirror compact so she thought they were great. Moving on the next school was the one I attended in High School and well it's a really wonderful school, but it's also almost an hour away and would be quite a drive. Again she didn't really know what to ask, but soon found herself getting more into it. She's so shy I worry about her going to a bigger school for high school. The one she's in now is small and she's been there since nursery school. Needless to say she is very comfortable there. She's also very bright and has a lot to offer any school she attends. I have no doubt she will succeed wherever she chooses to go. Okay back to the high schools. There were a few others we check out and asked questions and everything seemed to be so crazy. What was more important the proximity of the school, AP classes, Clubs, or sports. My head was spinning. My daughter really enjoys track and drama so whichever school she chooses they must have that to offer, but she excels in math so we want a really great math program. It's just so hard you want to make the right choice for your child. Not to mention private schools are so expensive. How will we pay for college once we get through paying for high school? I guess this is why they tell you to start early so you can weed out the schools you have absolutely no interest in going to. One mom asked me if we could please go back to nursery school. I looked over at my daughter who looked so grown up talking with her friends and I really wish we could go back because I'm not ready for my little girl to go to high school. Okay it's that wonderful time of year when I open up the girl's backpacks to find the notice that I despise. Lice is in the school. Then my daughter informs me they did a head check at school. Reflexively I begin scratching my head. The mere thought of them makes me feel ill and itchy all over. My girls have very long hair so if they ever got lice it would be a huge pain in the you know what. Not to mention they would totally freak out. So what can I do to keep those little critters away from my girls hair? Well a few years ago I spoke to my pediatrician about it because the note came home and I panicked. I thought if I treated her hair with the anti-lice shampoo they sell at CVS that would prevent the lice from infecting my girl's hair. They told me immediately not to do that if she didn't have lice because if she did come down with it the shampoo would not be as affective and it would be much harder to rid her of it. So this left me with the question of what I could do to prevent lice. Well they had a few syggestions for me. First off contrary to popular belief lice do not like dirty heads. They told me to load her head with hair spray, mousse or gel. Also to keep her hair in pig tails or braids and not to let it hang down and loose. Lice is spread from head to head touching or if things like hats and combs are shared. Okay so my children left for school today with the youngest one sporting a tight braid sprayed heavily with hair spray and the older one with mousse on the top and then a pony tail sprayed heavily with hair spray. Then I gave them a quick talk on not touching any one's head and not putting on a hat or using anyone's comb. Okay fingers crossed they don't get it. I have done everything I can think of to prevent it so hopefully all will be well.